Schlock-Wire: Scream Factory Blitzkriegs Blu-Ray With THE OUTING/THE GODSEND And CELLAR DWELLER/CATACOMBS In July – Schlockmania! A gift from Heaven…or a curse from Hell! Scream Factory presents a quartet of supernatural thrillers with brand new HD transfers. All part of the Scream Factory All Night Horror Marathon and All Night Horror Marathon 2 releases on DVD in 2013, fans called for better video transfers and here they are! 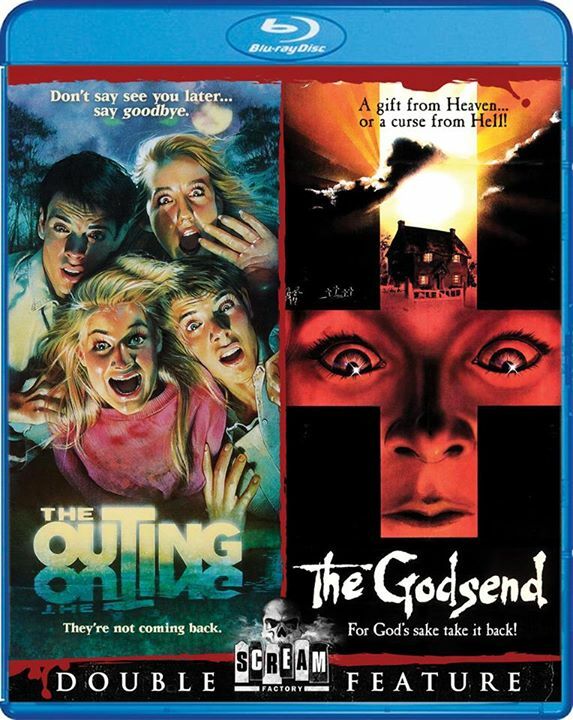 The Outing & The Godsend and Cellar Dweller & Catacombs make their Blu-ray debut on July 14, 2015. The promising career of a horror comic book artist ends in a fiery death when he confronts the carnage of his own imagination in his studio. Years later, an ardent devotee of the artist’s work becomes a resident in his house, now an art academy, unaware that her imagination has revived the grotesque murderer of the past…and that she may be the next victim. Shout! Factory will continue to present the on-going SCREAM FACTORY™ home entertainment series in 2015 with specific release dates, extras and key art. Fans are encouraged to visit Shout! Factory’s website (www.ShoutFactory.com), follow the brand on Facebook (www.facebook.com/ScreamFactoryDVD) and Twitter (@Scream_Factory), and view exclusive video content on YouTube (http://www.youtube.com/user/ScreamFactoryTV/Home).